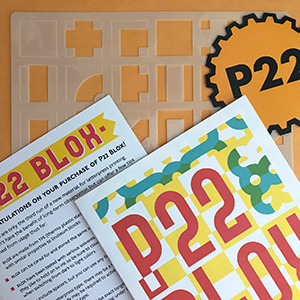 P22 Blox is a set of modular letterpress printing blocks made from space age material—plastic! It allows for a wide variety of lettering, experimental letterforms and pattern making, giving printers an entirely new medium to inspire modern presswork. This project was created as a collaboration between P22 Analog and Starshaped Press in Chicago. 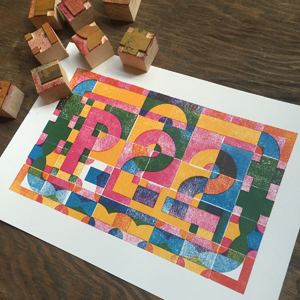 P22 Blox are injection molded plastic printing blocks for letterpress printers and educators. Based on Bauhaus principles of basic shapes, these simple forms can be assembled to make any letters of the alphabet. 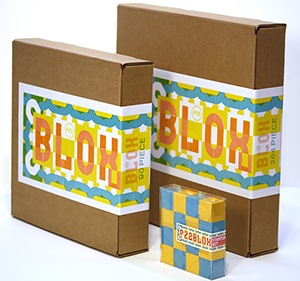 These Blox make for great team design and printing exercises in the classroom and are a great way to introduce letterpress printing on any level of printing press. The endless possibilities of how Blox can be assembled make for great creative thinking workshops. Unlike traditional printing materials such as wood and metal, these plastic Blox remove the intimidation factor of setting type by hand. Plus their light-weight square shapes are just easy and fun to work with. The initial P22 Blox sets were delivered in early 2016. A limited second run of P22 Blox was made in mid 2016. 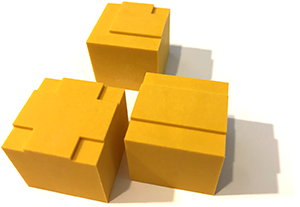 We have just cast our 3rd version of the Blox in stunning yellow as of July 2018. Supplies are limited.